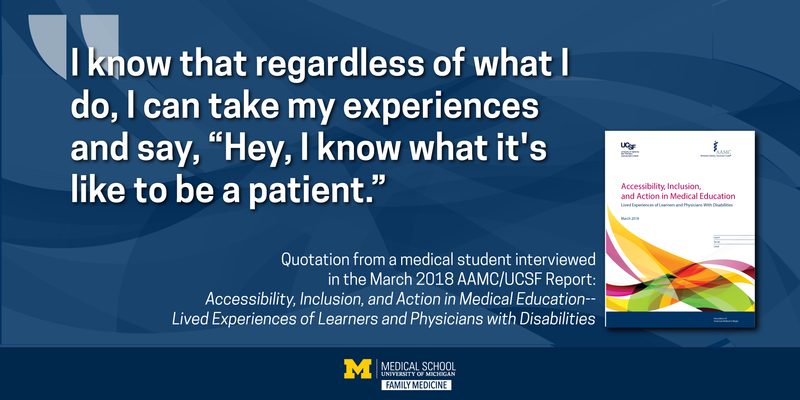 A new 2018 report from the American Association of Medical Colleges (AAMC), co-authored by Lisa M. Meeks, Ph.D., clinical lecturer, details the lived experiences of students and doctors with disabilities. The report, “Accessibility, Inclusion, and Action in Medical Education: Lived Experiences of Learners and Physicians with Disabilities” assesses the state of diversity and inclusion efforts to accommodate students with disabilities in American medical schools. With qualitative interviews with over forty stakeholders and medical trainees with disabilities, the report concludes that America’s medical schools are making progress in efforts to attract, admit and accommodate students with disabilities — though there is more work to be done. Meeks and report co-author Neera Jain, M.S., from the University of Auckland, New Zealand, led a team that reviewed the current research and legal climate around medical students with disabilities. Through an effort called the Lived Experience Project, they found and interviewed medical students and residents who spoke of their own experiences — both positive and negative. The authors conclude that improving access for students with all forms of disability will require a commitment by the medical education community. In U-M’s case, the report describes how the Medical School changed its approach to admissions and navigating technical standards requirements in the wake of research by the chair of the Department of Family Medicine, Philip Zazove, M.D., and Michael M. McKee, M.D., assistant professor, both of whom are deaf. Meeks' report further outlines how schools can improve their disability services programs for enrolled students and improve the culture around such students. A corresponding article in the April 2018 issue of Academic Medicine continues the conversation, providing recommendations for removing barriers and facilitating access for physicians with disabilities. Meeks and Jain previously wrote a guidebook for health professions schools on this topic, and both have served in disability services positions at top U.S. medical schools. Lisa Meeks joined the Department of Family Medicine in Fall 2017 as a clinical lecturer and has been an energizing force in the department’s focus on disability health. Together with the Canadian Association of Physicians with Disabilities (CAPD) and the National Organization of Nurses with Disabilities (NOND), Meeks and the Department of Family Medicine organized an early 2018 social media campaign, connected by the hashtag #DocsWithDisabilities. The media campaign, shared on Twitter and Instagram, features the personal stories of dozens of medical students, residents, physicians, and medical educators with disabilities, as they revealed the real challenges, perseverance, and life lessons along their journey in the medical profession. The goal of the Docs With Disabilities campaign was to "share stories from the professional journeys of physicians and nurses with disabilities, in their own words. By featuring the real voices of health professionals with disabilities--including their struggles and successes--[the campaign] hopes to foster awareness, visibility, and community that brings together stakeholders from across medical education, clinical practice, and disability advocacy." #DocsWithDisabilities has garnered hundreds of thousands of views, sharing, and engagements--from medical schools and health care executives, to popular press and patients advocating for more physicians with disabilities. It was recently featured by NPR science journalist Elana Gordon, in the NPR/WHYY science and medicine podcast The Pulse. The NPR segment "What does it mean to be a doctor with a disability?" is available to stream. The AAMC report and #DocsWithDisabilities campaign, together, have set the stage for revived national discussion of access for people with disabilities in medical school and the profession. Doctors with Disabilities have been featured by NPR Health and Kaiser Health News. 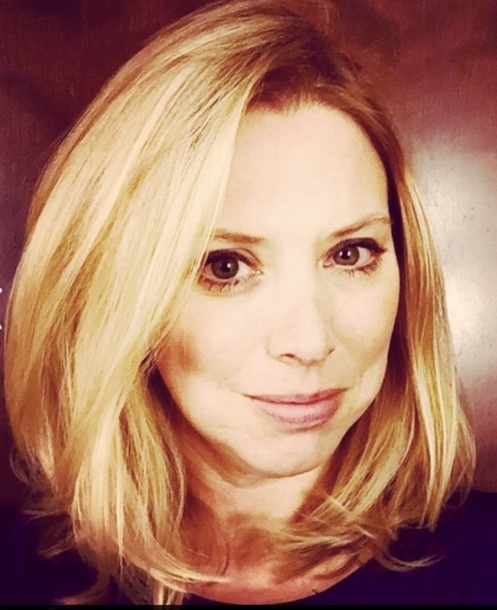 Lisa Meeks is also a clinician scholar at the U-M Institute for Healthcare Policy and Innovation and the current president of the Coalition for Disability Access in Health Science and Medical Education, which includes more than 500 members from institutions nationwide. The Coalition recently held their 5th Annual Access in the Health Sciences Symposium around the theme, The ABC's of Disability and Health Science Education: Access, Barriers and Culture.” The symposium was held at Northwestern University and included a plenary session with Oluwaferanmi O. Okanlami, M.D., clinical assistant professor in family medicine, with a joint appointment in the department of physical medicine and rehabilitation. Start with the free AAMC Report, "Accessibility, Inclusion, and Action in Medical Education: Lived Experiences of Learners and Physicians with Disabilities” published in March 2018. Follow the social media hashtags #DocsWithDisabilities and now #NursesWithDisabilities and browse our compilation of real physician stories and conversations here. See the big picture with press coverage and analysis from NPR, Michigan Medicine, and the New York Times.  Reach out to the Coalition for Disability Access in Health Science and Medical Education or email the U-M Disability Health Group in the Department of Family Medicine at disabilityhealth@umich.edu.